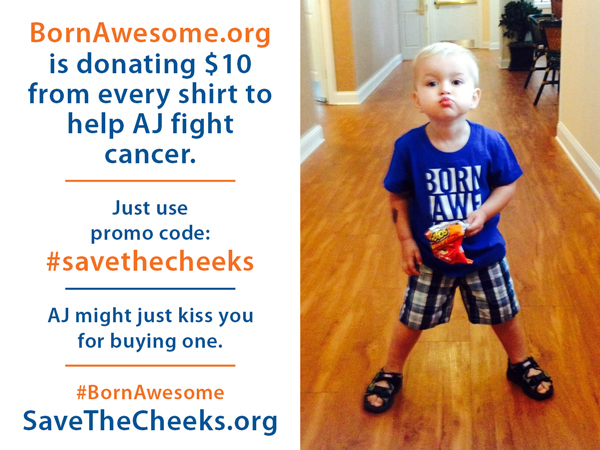 Our friends at Born Awesome are donating $10 from every shirt purchased using promo code #‎savethecheeks‬. That is half of the $20 price! Visit their online store to see the products they offer. A great gift for yourself or your kids reminds everybody to never to forget they were #BornAwesome‬! Celebrate the miracle of stability! If you would like to donate financially to help the Hock family cope with the costs of fighting cancer, please visit our Fundly campaign.